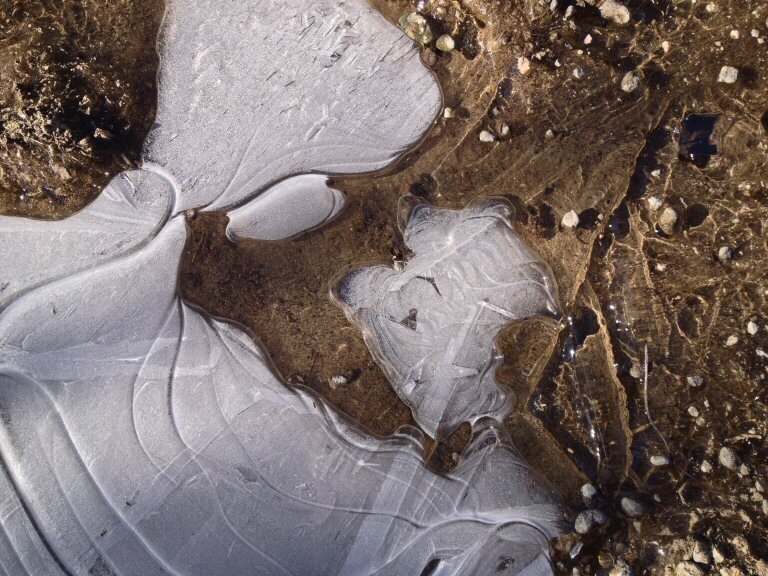 will El Niño save the coming winter/next season? If it does, there’s likely to be flooding in this neck of the woods but next summer’s small stream trout season might look a bit more promising. Here’s to hoping for a snowpack that more than makes up for what was lacking this year. Categories: California, Fishing, Fly Fishing, General Discourse, Sierra Nevada, Weather | Tags: California, El Niño, NOAA, Sierra Nevada, weather | Permalink. There’s something about getting off the beaten path that brings about a certain type of inventiveness. That’s not to say that city folk don’t have their fair share of ideas. Perhaps it would be more accurate to say that when left to employ natural resources, interesting things happen. Skagway’s just such a place. The ship docked in Skagway that morning under overcast skies. The ocean astern was steel gray. A later departure time for our shore excursion allowed for a lingering breakfast. Our decision on a Skagway shore excursion was predicated on setting aside time for walking around town. So, to ensure we’d have the afternoon to explore, we chose the White Pass & Yukon Route Railway summit excursion, a 20-mile ride to the 2,865 foot high White Pass summit. 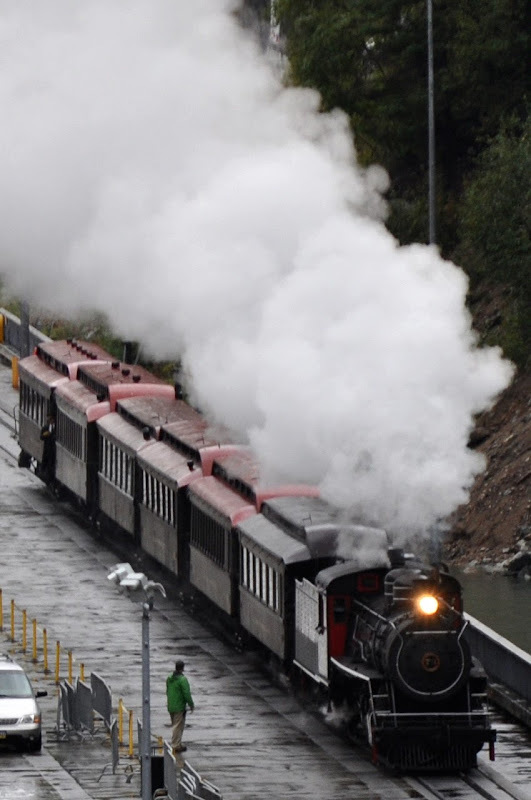 The WP&YRR was built in 1898 during the Klondike Gold Rush — ironically completed after the Gold Rush was finish — as an alternative to the trails climbing almost 3000 feet in just 20 miles. 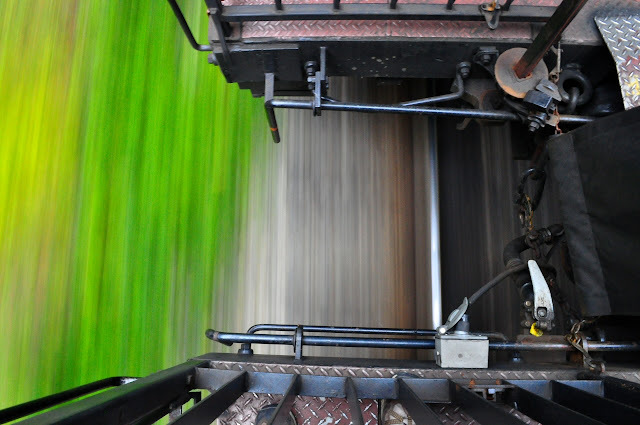 The narrow gauge railroad was a cooperative project that brought together American knowhow, British money and Canadian labor. 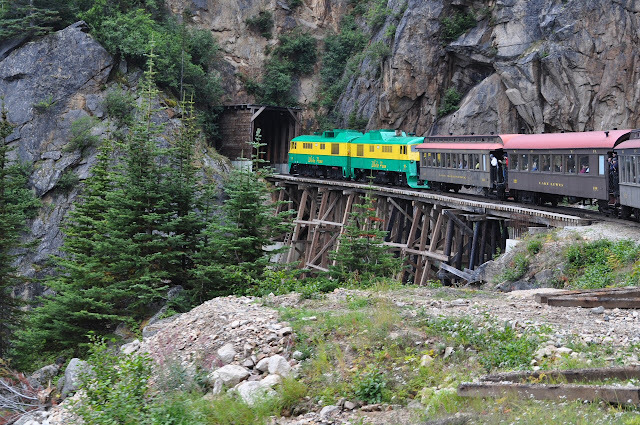 In a vintage coach car we passed through the east side of Skagway and began a climb that would take us past Bridal Veil Falls, abandoned trestles, Inspiration Point, Dead Horse Gulch and broad vistas looking back on Skagway and down to the Skagway River. The trees and bushes were painted with a blush of fall colors. Leaving the forest behind, we entered the alpine zone and arrived at the summit, our halfway point and the only point of the trip that entered Canada. The hard beauty of the summit was accented by trees dwarfed by a short growing season and heavy snow. Summit Lake seemed to kiss the edge of the railroad bed. Fall color in the railway bed. Then it was time for the “Summit Shuffle.” We were instructed to stand up, grab the back of our seat and pull it towards us, reversing the direction of the seat, then move to the opposite side of the aisle, guaranteeing that everyone would be have a new view for the ride back to Skagway. A neat trick. Just as remarkable was every passenger’s good natured approach to switching seats. It was clear that on this trip we’d be laying groundwork for a return, as we soon accepted that our trip on the WP&YRR would one of those excursions that’d be repeated. Now knowing that Skagway isn’t a large town, next time I’d opt for the full-day 67½-mile WP&YRR trip to Carcross, Yukon. The first sight to greet us after disembarking near town was that of pink salmon, stretching from bank to bank and filling the Skagway River. It’s one thing to see a few salmon heading upstream, or someone else’s video, but it’s another to see enough fish, hundreds of salmon, give reality to the old timers’ expression that “one could walk across streams on the backs of salmon.” I spent some time in awe of this sight, so stunned that I didn’t once wish for a fly rod in my hand. …well, maybe once. The main part of town is a bit of a walk past what is probably one of the smallest immigration stations I’ve seen, the WP&YRR station and WP&YRR rotary snowplow #1. Downtown Skagway still has that small, frontier town feel, albeit with the obligatory stores focusing on cruise ship passengers (jewelry and souvenirs). If you ignore those tourist traps, there are some interesting local shops, including a yarn store that required a stop for the wife for a gander at qiviut (kee-vee-uh’ t) yarn. However, the price of this qiviut — the soft wool lying beneath the long coat of the Arctic muskox — made me wonder if it was laced with some of that Yukon gold (nearly $100 for 1 ounce!). 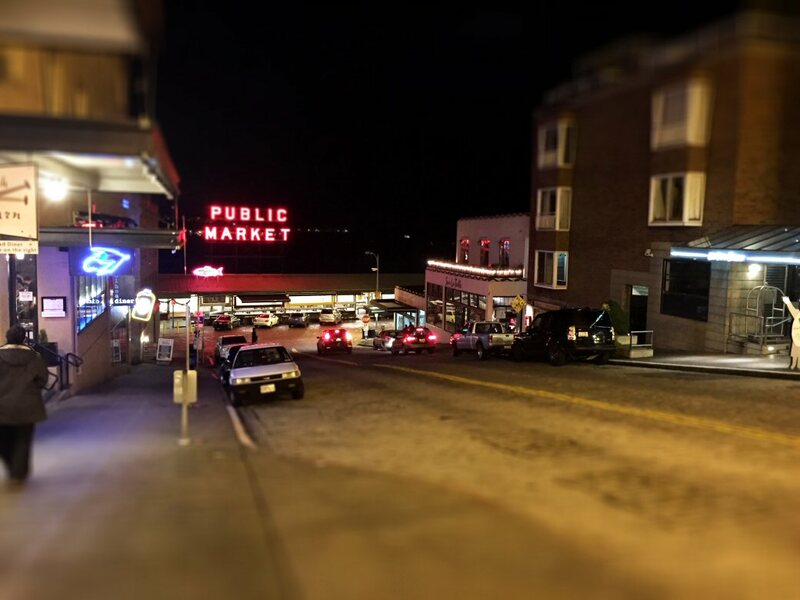 But well within the budget, down near the end of 7th Street sat Skagway Brewing Co. Now, I’ve been scoffed at for usually refusing to drink, much less pay for, relatively flavorless beers. 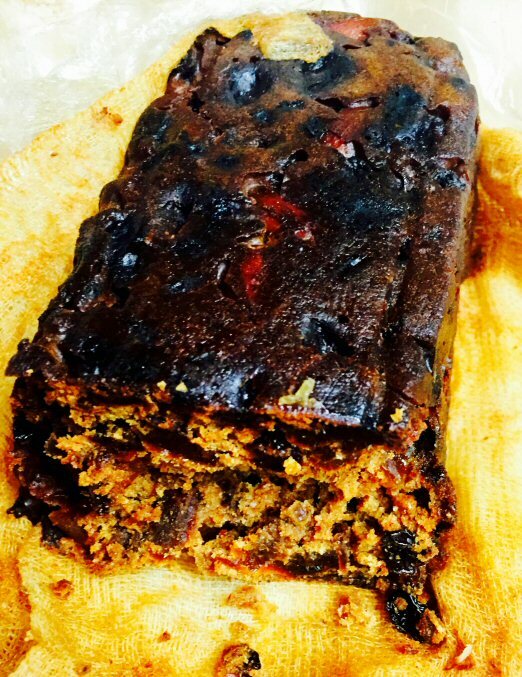 It’s a principle that serves me well and often leads to pleasant surprises. 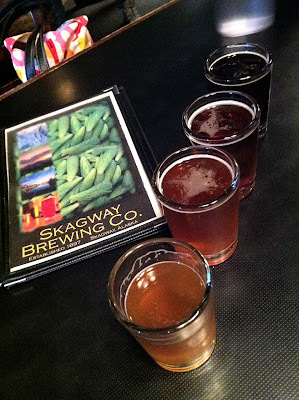 Skagway Brewing’s signature ale, Spruce Tip Blonde, was one such surprise. We decided on lunch at the Skagway Brewing Pub, and started with an appetizer flight of the only-available-in-the-Pub beers: Prospector Pale, Chilkoot Trail IPA, Boom Town Brown, Blue Top Porter and the only outside beer, Alaskan Brewing’s Amber Ale. All were good, but absent from the flight was the Spruce Tip Blonde. Told by the waiter, of course, that Spruce Tip Blonde was worth a full glass, it would be the beverage accompanying some pretty awesome fish ‘n chips. Brewed with hand picked Sitka Spruce tree tips, Spruce Tip Blonde offers an experience that begins with an almost flowery aroma of spruce but tastes of a unique sweetness akin to a fruit and/or spice. If you’re ever in Skagway, the Skagway Brewing Pub is worth a stop for lunch and beer. Or two. 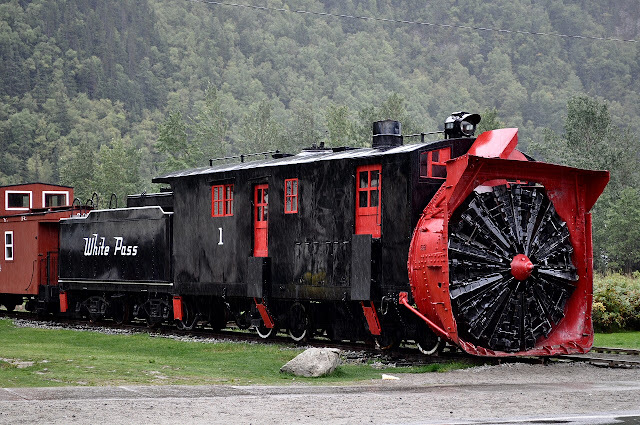 Rotary snow plow #1 of the WP&YRR. The steam engine of the WP&YRR at the dock. Categories: Alaska, Beer, Canada, Family, Salmon, The Wife, Vacation & Travel, Weather | Tags: Alaska, beer, Canada, salmon, yarn | Permalink.